I don’t know why, but the Internal Revenue Service strikes fear into my heart. It’s weird. I mean, hell, I’m Canadian. I have a justifiable wariness toward the Canada Revenue Agency, but the IRS shouldn’t even be on my radar, right? Maybe it’s because of my innate problem with authority figures. Maybe it’s just from watching too much U.S. television during my misspent youth, or maybe it’s the fact that the eagle in their logo issues a subliminal promise to cheerfully rip out my entrails and snack on them. For whatever reason, the IRS scares me worse than the CRA. This wouldn’t be a problem if, like most Canadians, I never had to deal with the IRS. But when I published my books, I began to receive royalties from none other than the U. S. of A. Which meant I had to creep out of my comfort zone and confront The Eagle. Navigating the government forms didn’t bother me – after years of dealing with legal contracts and business documents, the red tape felt comfortingly familiar. But then, completed forms in hand, I had to actually phone the dreaded IRS. Knees knocking, mouth dry, I dialled with a trembling hand. When the agent answered I nearly hung up in a funk. Unlike CRA agents who answer with their first names, IRS agents identify themselves with intimidating formality as ‘Ms./Mr. LastNameOnly’, and then they spew out a big scary-sounding number. But apparently it was. Several years passed without incident and I gradually overcame the fear that the IRS was lurking around the corner waiting to swoop down and gut me. Then last week I had a terrifying thought: I’ve never filed a US tax return. I don’t owe anything since I pay income tax on my royalties to the Canadian government, but here in Canada you still have to file a return every year even if you don’t owe anything. What if the IRS required that, too? Ohmigod. The IRS was finally going to get me. Cue up the telephone scene again, with me looking even more scared than before. I got a male agent this time, which somehow seemed more ominous. Mr. Hartman snapped out his name and his long scary number and I nearly fainted before managing to stammer out my question. And everything was fine. Miss Weebles had done a bang-up job, everything was in order, and I don’t need to file US tax returns. Mr. Hartman was pleasant and friendly. He even joked a bit and was kind enough to ask about my books. I hung up the phone with a feeling of unreality. Has my fear been completely unwarranted all these years? Or is the IRS just lulling me into a false sense of security before they unleash The Eagle? Never dealt with the IRS but was audited once by CRA. They ended up owing me more money. That’ll teach them. Both the CRA and IRS scare me. Even a tax assessment notice can cause me to break out in a sweat in case there’s some hidden meaning in the notice that I missed. They are very subtle you know. That’s very true. Like wizards: “subtle and quick to anger”. My dad had a great IRS story-he was self employed (as a science writer) and had to take a short work-related trip for some reason when I was a kid. He went as cheaply as possible, took the train coach rather than a sleeper car, no hotel, just traveled overnight, did whatever he needed to do and took the train back that night. So his total expenses were train ticket, a couple of meals, maybe a taxi, etc. He submitted the expenses but was audited so he had to appear at an IRS office and produce all his receipts. He went over everything with the examiner and had receipts for all but $5 of the amount he claimed. The auditor asked him about the missing $5; he said it was for a cup of coffee and a pastry at the train station. The guy actually started hassling him about claiming the extra $5! Dad got pissed and demanded to speak to the examiners supervisor. The supervisor came in, looked at the records/receipts, and he actually apologized to my dad and closed the case! I also understand the instinctive panic reaction to the IRS. I rolled over an IRA a couple of years ago; did it all correctly, never took possession of the money; the company I was rolling it over to actually did all the paperwork. But the following year I after I filed my taxes I got a notice that I owed something like $15,000 in interest and penalties. After I started breathing again I placed a panicked call to my accountant, he pulled my file and said that all the documentation the IRS needed had been attached but he would resend it, and not to worry. I did get a notice a month or so later that the issue was resolved and I didn’t owe anything more, but it sure was scary hearing from them! Love the new cover! Might be time for another re-read of the series. Thanks! It’s a relief to get the first cover done – there was a lot of setup work involved, but I hope the subsequent ones will go a little faster. That’s a hilarious story about your dad, and it’s nice that it had a happy ending. An apology from a tax auditor has to be something to write on the calendar and preserve for posterity. But $15,000?!? I’d need CPR after opening that envelope! Crikey, Diane, I’d never even thought of international tax (for when my book becomes an international best seller… you know, when I finally get around to writing it. Even starting it would be a good thing. Sigh) At least you’ve got yours sorted. And your cover’s looking good too. With larger and larger phone screens becoming the norm, I see Kindle sales leveling out. At least. If large-screen phones had evolved first, we wouldn’t need Kindles at all. I love the idea of redesigning all your covers with your face, or portions thereof, instead of a wide variety of auburn-tressed women all purporting to be our beloved Aydan. Great work. It must mean your books are doing well for you, if you can hire pros instead of using stock photos, and that you must also worry about the IRS too. I also have had to make those calls to the unfailingly nice folks at the IRS which is a bit odd since my earnings are so meager. Proving this to them is a bit of a battle, and recently has gotten worse. Last year I gave up on the online free filing altogether since I find I must do it manually first in order to give the right answers to the interview-style format that seems ubiquitous. All too often I get almost done and then I get a message stating that the free version doesn’t support a critical form I must use, but for only so much money I can purchase rights to use a program that does offer it, but I’ll need to start all over again. So I do it the old-fashioned way, but even that strategy bit me in the behind when I overlooked a couple of lines on my brokerage 1099 report. I got a bill from the IRS to the tune of $3.5K. In my fear over the might of the big eagle, I paid first and asked questions later. No worries, it turns out that I am owed a few hundred less than I originally thought, and I’ll get back all that I paid and more. I’ll do better figuring out my taxes next time, it will just take more pages to get the job done. Last count was that it takes me 20 pages of documents to prove that I have no taxable income. Good thing you are not living a few hundred miles South. But I am happy to hear that the good folks at the IRS treated you with tender care and kept the talens and beak to themselves. Yikes! If I were you I would’ve paid the money instantly, too. Even if I wasn’t making two dimes to rub together I’d still be afraid of the talons and beaks. Um, yeah… that’s it; ‘two or three years too young’. I think the one on the Spy, Spy Away cover is two or three years too young to drink legally. I watched too much Canadian TV during a misspent youth, especially SCTV. And twenty point thix per thent! You tho rock! I don’t know why I was so worried about the IRS in the first place, or why I was surprised when they were nice to me. I really am a paranoid freak. Wow, I never thought about the IRS issue. So many things you independent authors have to keep in mind. Do you have to fill something out for every country you have sales in? Bahahaha!!! I dunno; it might not be a good idea to take potshots at The Eagle. I really like the new cover. Will our ebooks update to the new cover art? BTW, I recenty reread all 9 books in order. I will often reread a book once or twice if I really enjoy it, but, I think this is my 5th or maybe 6th reread of the first ones. That’s kind of rare for me. I think the only other books I’ve read more times are the Bible and The Stand by Steven King. So, thank you for all the enjoyment you’ve given me. It makes the cost VERY well worth spending and I’m eagerly waiting for book 10. I receive several emails about free and discounted books, but so far, your books are the best find. I think all the companies do it differently. I believe you always have access to the updated version, but it may be a setting in your account to automatically download updates as they occur; or you may need to do a manual download to get the update. 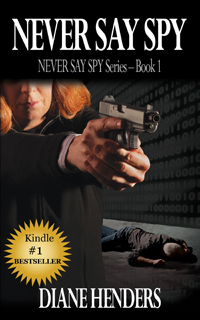 The new version of Never Say Spy should appear in Smashwords and Amazon tomorrow or Friday and the change will propagate through the rest of my distributors within the next couple of weeks, so I guess if the update appears automatically in your reader you’ll know you’re getting the latest; otherwise you might have to do some hunting to get it. But if you can’t seem to get it from your distributor just email me and I’ll send it to you. Thank you again for the lovely compliments – I’m glowing! I love the new cover! Can’t wait to see the rest of them. Ha! I had exactly the same thought before I posted a reply. Sad, that. The cover looks great, Diane! I especially like that dead guy on the floor.